This is the c. 1824 London Bridge, which was discovered to be sinking into the Thames in 1968, due to the modern traffic load. The bridge was sold to Robert McCulloch for $2,460,000 (US), and shipped half way around the world in blocks, to Lake Havasu City, Arizona. The bridge was rebuilt under the supervision of Nottingham civil engineer Robert Beresford. To withstand modern traffic, the rebuilt bridge has a steel reinforced concrete core. 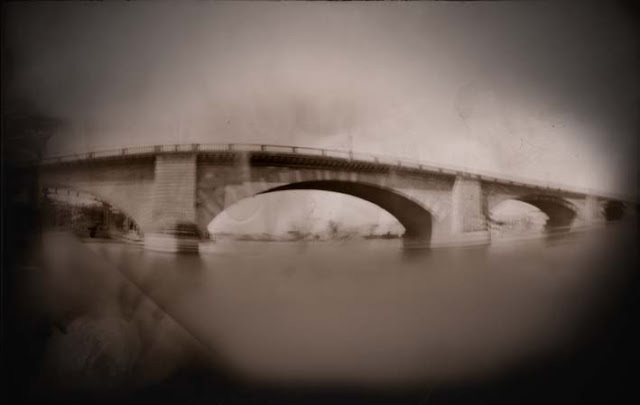 The grand opening of the London Bridge in Lake Havasu was October 10, 1971.
homemade paint can pinhole camera, wiggling in the wind, 66-second exposure, scanned, post processed in Photoshop. We visited London Bridge over Lake Havasu in January. We walked and drove over it, walked and paddled under it, and made several pictures and video of it. Here we are, on the southwestern side of the bridge (the island side) , along Bridgewater Channel. Contrary to the feel of these images, it was a brilliantly blue, bright and sunny day. images made January 22, 2011. 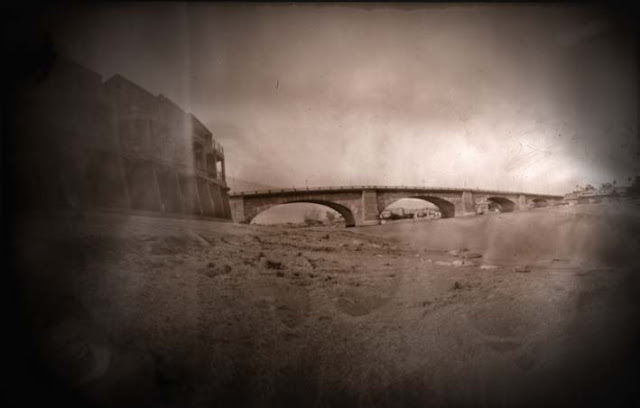 There's something about your pinhole process that really evokes the sense of history of this bridge - beautiful work! What beautifully sharp images, Kristy! I love the story behind the London Bridge. Question: How large was the photo paper that you used in these pinhole photos? I sure love the London Bridge story too! While learning about this bridge, we also learned a little bit about other London Bridges that have spanned the Thames over the ages. When we paddled under it in our canoe, I really felt the history, you know? I felt a wisp of England, and the people who crossed the bridge every day for over 100 years. Thanks for that info, Kristy. I'd like to use photo paper eventually, it looks like so much fun.